im thinking about taking this course in february next year, tryin to find as much info as possible then i stumbled across this- really helpful stuff. how long did u stay for? Nice to find a weblog about my home land.If there is any thing I can help ,tell me. Hi Thomas, I am glad it was helpful. I was in the course for seven weeks. Some students stay much longer. Do they have semesters or any other timetable? Their website is silent about it. There are no semesters. You apply in advance, and let them know when you want to arrive. If there is a problem with your arrival date, they will let you know, I'm sure. thank you for this information! As you said, there is not much information on the UI homepage. How much did you pay for the course and the stay in the guesthouse? And did you attend additional courses like calligraphy or arts? I paid for the course and the accommodation using US dollars once I had arrived in Isfahan. The University will give you the necessary details once you arrive, and once you've paid, you show them the receipt. As far as the actual cost goes, that depended on how long you stay (if you stay for a longer time, the price per week drops). From memory, I think it is about US$200 per week, including accommodation. You need to pay for your own meals however. I did not attend any other courses. I'm not aware of anyone who did. Perhaps they are available. I have no idea! Hi, thank you for the very informative blog, Damon. Just one quick question, I'm planning to stay for 5-6 weeks, how did you deal with the money issue? Are there ATMs around or did you take cash to support you for 3 months? There are ATMs in Iran, but they do not work with foreign cards. Furthermore, you cannot use foreign credit cards in Iran. I understand these restrictions are due to sanctions. The only failsafe way I know of is to bring cash, preferably US$ (but Euros will work too, possibly with an inferior exchange rate). One tip: bring recent US$, because banks will refuse to change notes if they are too old (as I found out to my horror the first time I visited Iran, with notes that were from the early 1990s). The only way you can change "old" bills is in the market, where you'll get a worse exchange rate (the money changers have some kind of arrangement with people in Dubai). I want to ask how can I get in contact with this office? Obviously they do not have an e-mail. How did you? And should I have any qualifications for applying this program? If you read my follow-up post, that is mentioned at the end of the blog entry, you can see that they do use e-mail. You can ask them about qualifications and any other questions too. Hi. 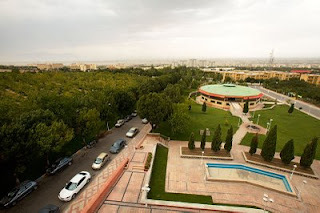 I found your weblog when searching information about isfahan univ. very helpful.Thank you very much. and I am thinking of studying at this course next year. One question, how did you handle with the loundry problem? You will see this banner at some time of the year - Esfahan is half the world! I taught English at the British Council in 1977, near the Si o se pol. What a lovely city! Hi David, I'm stoked to find some information on what's it like for a foreign student to study in Iran. I'm from london and really want to become fluent in farsi, as I'm half Iranian. My dad says it isn't safe for me to go alone, so I want to live on campus and study farsi everyday. Is this what you did? How did you get in contact with them? Did you just email and begin communications via email? I hope you are well and have the time to reply! Many thanks, rokhsan. I offer Farsi classes(Intensive,Short-Term, and Long-Term classes privately). you may also send me an email at : m_h_mohammadpur@yahoo.com for more assistance. I have exactly the same situation as you, I wondered if you ever made it? If not, I was wondering if you wanted to go from London together? David - thanks for the very helpful blog! Thanks so much for this information! I'm looking at moving to Isfahan part-time in about the next 5-years and wondered where I could take Farsi classes, so this is excellent! Now I know where I can take classes. Very excited! "Online Course" is now available upon many of my former learner`s recommendation. Why not have some hours of online Course via Skype to learn the first steps of time-consuming alphabet and beginner levels so that when you plan to be Iran you will be able to make most of your time and progress faster. I have been teaching Persian since 2008 to non-Farsi speakers(but languages for about 15 years.Feel free to ask any questions you`d like to know regarding learning Persian in Iran, I`ll be happy to be a help.